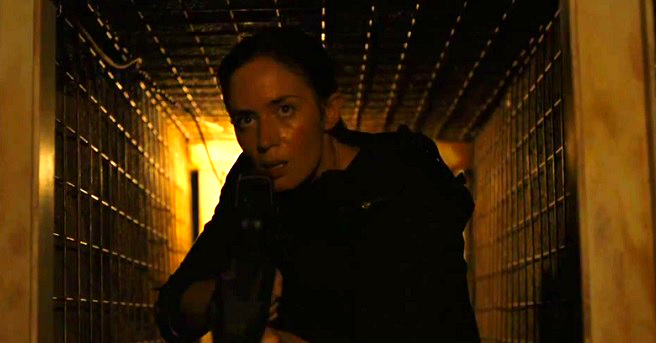 From its incredibly ominous opening, right through to the pitch-black climax, Sicario is scintillating crime cinema at its finest. With a trio of commanding performances at its centre, Denis Villeneuve proves yet again that he is an excellent director of morally complex thrillers. Packed with tense set-pieces and a standout turn from Benicio del Toro, Sicario has the power and potential to please both arthouse audiences and the mainstream crowd. 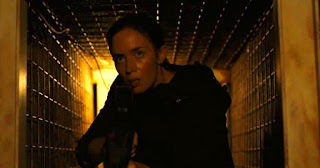 Emily Blunt plays Kate Macer, an idealistic FBI agent who is hunting down victims kidnapped by cartels in Arizona. When her crack unit uncover the bodies of over 30 victims, she is enlisted by a shady elite task force, headed up by the flip-flop wearing Matt Graver, played with effortless cool by Josh Brolin. But Kate is left in the dark by the officials that have drafted her in, as the war against the ruthless drug trafficking cartels intensifies, Kate finds herself out of depth. Operating around the dangerous border between the U.S. and Mexico, Kate becomes embroiled with an operative even shadier than her superiors; a man with a past so murky, it can be difficult to know which side he is on. Benicio del Toro is great as the blank-eyed, shark-like presence at the heart of Sicario’s dark moral core. His Alejandro is a suspicious man from the moment Kate lies on him. The suit, the quiet determination and his overall moody demeanour make him a difficult character to warm to. But compared to Blunt’s much more wide-eyed and straight-laced Kate, he is a far more interesting character. It is very welcome to see a female lead in this kind of film, with Blunt managing to deflect much of the machismo that surrounds, and is directed towards her, but unfortunately her character gets overshadowed by the huge presences of Brolin and del Toro. Still, Kate is the moral compass of the story, and a vitally tough character adrift in a sea of suspect individuals. Towering above even these fine performances is the atmosphere created by Villeneuve and his collaborators. Roger Deakins’ cinematography, so often praised in any film he elevates, is stunning here. Every shot drips with tension, particularly as Deakins takes a sky-high view of the border and messy towns and roads below. Accompanied by an incredibly moody score by Jóhann Jóhannsson, it’s the kind of film you can’t shake off easily. And more importantly, it’s a film you will almost immediately want to see again and again and again. Violent, tense, terrifying and strangely beautiful; Sicario should be seen in the darkness of a cinema, but will likely leave you stumbling for the light.